More than 30,000 tomato workers labor in Florida during the six- to seven-month harvesting season, and it seems like they wouldn’t be overwhelmed by Chipotle’s agreement to pay them an extra penny a pound. Yet that amount represents a 64 percent pay increase for the workers. Chipotle will be sourcing its tomatoes exclusively from East Coast Farms, one of Florida’s largest tomato growers. That's right, friends. 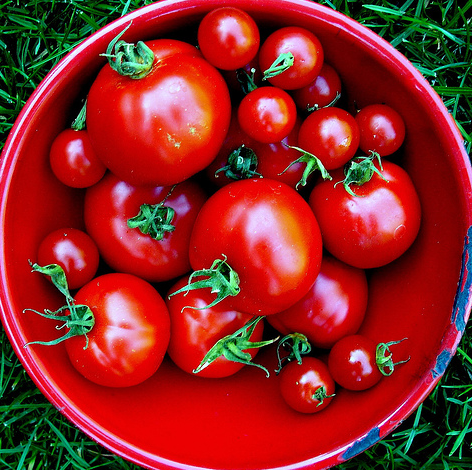 Unlike its competitors, Chipotle Restaurants will pay tomato workers an additional penny for each pound of tomatoes they pick. A far cry from fair trade, maybe, but a step in the right direction, nonetheless. I'd encourage you to read the entire Restaurant-Hospitality.com article, which places this move in the context of other business decisions and competitors. Most pigs do not spend their lives on open pastures, but live in Concentrated Animal Feed Operations, or CAFOs. The conditions in a CAFO are bad, even horrendous. In many ways, they look more like factories than farms. Pigs are crowded so closely with other pigs that they must be given antibiotics from a young age to avoid the spread of infection. According to the Union of Concerned Scientists, American pork producers use 10 million pounds of antibiotics per year to keep their confinement raised pigs from getting sick. That’s more than an estimated three times the amount used to treat all human illnesses. Pigs raised in these "factory farm" conditions, about 95 percent of all of the pigs raised in this country, often don't even have room to turn around in their crates, let alone experience the outdoors. It's stressful and inhumane for them, and it's surely not healthy for us either. We think there's a better way to do things. It's called old-fashioned animal husbandry, which means farmers rely on care, not chemicals, to tend their animals and their land. Pigs raised in this way are not given antibiotics, and their feed does not contain animal by-products. They are free to roam the pasture, to root in deeply bedded barns, and to socialize with other pigs. We believe pigs that are cared for in this way enjoy happier, healthier lives and produce the best pork we've ever tasted. We call pork produced according to these standards naturally raised, and sourcing it for our restaurants is part of a larger mission we've dubbed Food With Integrity, an ongoing quest to source the highest quality food from farmers who care deeply about the welfare of their animals, their land, and their communities. Since 2001, all of the pork served in our restaurants has been from pigs raised in this humane, ecologically sustainable way. In addition to all of our pork and all of our chicken in the US, more than 50 percent of our beef is naturally raised. And we'll continue until all of our meats in all of our restaurants meet this standard. 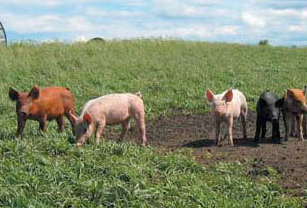 Letting pigs exhibit their natural behaviors in open pasture or deeply-bedded pens. Vegetarian feed with no animal by-products. There you have it. Chipotle favors "old-fashioned animal husbandry," thinks CAFOs are bad, and has a larger mission they call "Food With Integrity." Is it okay for me to admit that I kind of like how their food tastes, too? Unfortunately, I can't do anything about the carbs. This post was proudly submitted to Food Renegade's Fight Back Friday.